This page is for advanced users only. A misconfiguration here may block requests to your API endpoints or website. A web application firewall is no replacement for properly implemented security in front- and backend. Main Rules: This rules are globally valid. Usual use case: Blocking code fragments that may be used to gain access to the server without permission (for example SQL-/XPATH-injection for data access) or to gain control over a foreign client (for example XSS). Basic Rules: This rules are usually used in the locations to whitelist main rules by id inside a location or for additional rules. A good place to start are the OWASP Cheat Sheets. In addition to the self defined rules, NAXSI contains libinjection which is available directly in the location configuration. The NAXSI project itself has a high quality documentation for the module online. A good ruleset to start can be found at GitHub on the project page. It cannot be provided by the plugin because of license issues (GPL cannot be used in BSD 2 Clause code), but you may enter it manually by yourself. WAF rules are used to trigger an action if a condition evaluates to true or false (negated). The usual use case is increasing a score which can be checked afterwards, but a rule can for example also block instantly (the plugin only supports a score). WAF rules are grouped to a WAF policy, which then can evaluate the aggregated score. The description will be shown in the GUI and the Message will appear in the log. Negate will switch the condition form “if” to “unless”. The ID must be unique. You should use a scheme like 1000 to 2000 are SQL injection or similar because that improves log evaluation if needed (for example you could create pie charts because you can group by the id range). The next section describes the rule type and the match. You can scan the match value like truncate (an SQL keyword to delete the content of the table) in different places in the HTTP request. Mostly all of them can be checked or as an alternative, you can use a name so it will only match a specific header for example. Please note that not all of them are compatible with each other so please consult the NAXSI docs. The name is used in the location select box, rules are a collection of the previously created rules. In the last step, the rules must be applied to the location. To enable the WAF in a location you have to check the “Enable Security Rules” checkbox. At the beginning, it would make sense, if the “Learning Mode” is enabled (nothing is blocked but logged, so you can add whitelists until you don’t get any false positives anymore). The next two boxes are the score for libinjection. Both will add a score of 8 if they trigger. So values up to 8 will block. 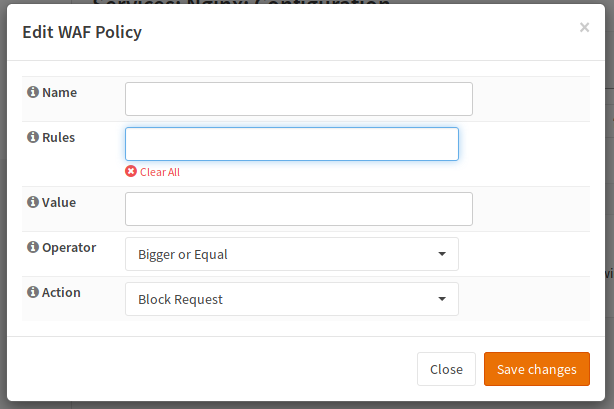 In the next dropdown, you can select your custom policies, which will be applied now. If you trigger the WAF by creating a request looking evil to the WAF, you should get a message in the server error log as well as an OPNsense branded error page (Request Denied For Security Reasons). You can use “NAXSI” as a filter in the filter box of the log viewer when viewing the error log.